Kayla's Place: Spotlight & Excerpt: Obstacles by Christopher Reardon - Read the 1st 4 Chapters! 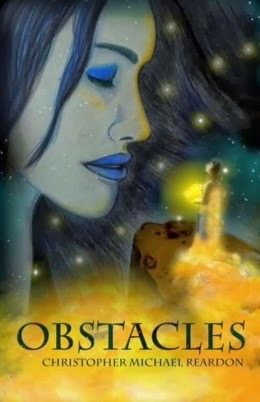 Spotlight & Excerpt: Obstacles by Christopher Reardon - Read the 1st 4 Chapters! A swift slice of the blade almost severs my head. I gasp, ducking with enough speed to evade the onslaught. I swear this man doesn’t just want me dead. He plans to wipe my existence from the universe. His failed assault leaves him vulnerable, allowing me to kick his shin with full force. He wails upon impact. A flame ignites in his soul. I’ve transformed this beast into an all-out monster. I dart away from my enemy, desperate to find safety. Alas, the blow does not impinge on his agility. He charges with outrage. Thankfully, before he arrives I’m able to rise into fighting stance. I aim my sword’s tip directly between his eyes. He mirrors my action. We commence circling each other. How in the world did I get here? I’m no sword fighter! I’m a doctor for goodness sake. My memory blurs with reality. Both become a mesh of the same. The only thing I’m sure of now is that I’m about to be killed. Not willing to trust my defensive skills, I lunge forward to stab my attacker. The man parries this pitiful attempt with ease. He smirks at my naivety. Casting my blade aside with his own, he juts forward and clocks my face with his fist. The intense blow demolishes me. I crash into the hard mountain dirt. The bombardment hurls my sword across the stadium to vanish into abyss. It’s not such a big loss. I mean it’s not like I can use it well anyway. It’s as if the world knows my fate. Pitch black sky transfigures into reddish hues. Blood flows down my cheeks, meshing with my dark mocha skin. All hope is lost for me. There’s no doubt about that now. Inhaling my last gulps of air, I contemplate if death will hurt. The man strides to my location. He savors his kill with each footstep. A stroke of luck suddenly arises as I detect a sturdy stone beside my leg. Never breaking our locked eyes, I maneuver my arm to the rock. Intense darkness shields my plot. His blissful stride indicates complete ignorance. Grasping the stone, I adjust my legs into leaping position. “Alcott…” my attacker wheezes. “You’re a dead man.” The words don’t faze me. He whisks over with eyes blazing murder. Just as he raises his sword to annihilate me, I hurl the rock at his face. “Ahhh!” he wails, dropping his blade to the ground. Immediately upon the smash, the red sky evolves into a cobalt blue haze. The color alteration allows just enough light to portray his shock. Eyebrows rising, he sprints to his abandoned sword. I’m still too petrified to locate my blade. I don’t even know where to start searching. My chance instantly fades. He retrieves his weapon in no time. “You’ve done it now,” the man proclaims into blackness. What did I think chucking the rock would accomplish? Perhaps I wanted to show him I’m not going down without a fight. Either way I’ve done nothing but ensure my demise will be hell. I guess I could reason with this monster. Despite that being my only chance, I’m just too fatigued. He sprints to my helpless body, excited to end me. Abandoning all confidence, I can do nothing but accept defeat. I’ve never felt so worthless in my entire life. Without warning, a high-pitched screech pierces the night. The man’s blade halts in mid-air. It echoes against each mountain. A ghostly hawk dives into the stadium. With another wail it barrels into the man at full intensity. Blue atmosphere vanishes leaving a shimmering orange fog in its place. The hawk’s wings spread wide, enveloping the man’s face in a sea of sharp feathers. Could this really be happening? My avian soldier bombards him. It drills with its lethal beak. The spectacle floods my veins with adrenaline. I actually thought I was done. Summoning stamina I rise despite my half-asleep limbs. I stride to him with new-found fire. The hawk senses my approach with a screech. It abandons the man entirely. With him now vulnerable my clenched fist bashes him in the face. The punch is far more powerful than anticipated, smacking his body against the dirt. He’s clearly frantic, cursing everyone and everything that ever existed. This universe approves of my frenzy. A bright yellow atmosphere appears. He hops back up in no time. This monster’s not going down easy. I panic once more as I still remain weaponless. Delving into the shadows, I inspect the darkness for my blade. All I can locate, however, are patches of dirt with occasional pebbles and weeds. If I don’t find it fast, I’m out of all options. Scrambling amongst the gravel I make no progress whatsoever. “Where is it? !” I moan into the murk. I cringe as a raspy voice responds. “Gone,” the man wheezes into my ear. I wail in utter horror. Turning to defend myself, I realize it’s too late. He stomps my torso into the dirt with ease. I can do nothing but cough out all my strength. “Hiss…” my ears detect to the right. What could this be? The man shares my confusion. His beady eyes scan the ground. A rattlesnake barrels through the gravel, slithering my sword amongst its coils. My terror transforms to hope as I lunge for the blade and creature. Grasping them both, I block the man’s attack. The serpent hisses at the man with a glare. Its allegiance must lie with me. I can’t help but grin as he leaps back in bewilderment. Though I’m just as clueless, I smirk at the circumstances. Venom spewing amongst its fangs brings him to insanity. He slashes the reptile, chopping it into two slimy halves. The tragic killing of my new friend charges my nerves. I spring up determined to end this evil once and for all. Our blades clash in metallic uproar. Both of us lose all balance. I attempt to jab his chest. Yet, he detects this in my eyes. He grasps my arm like a grappling hook. My skin stretches until blood rises. His strength surpasses any I’ve ever seen before. Despite every force in me saying to keep fighting, the grim reality is impossible to ignore. My life might actually be over. “Please! No!” I whimper like a mule. I’m a complete fool ashamed of this behavior. Despite how much I plead, no mercy is shown in return. The man’s blade twirls along the gentle gusts. It accelerates every second. My heart beats with unstoppable energy. How does it not burst out of my chest? I close my eyes, waiting for whatever fate may be dealt. I’m certainly not strong enough to battle anymore. This man has conquered me. “No!” I howl across the living room. I plummet off the shaggy tan bedspread. My body smacks the fuzzy carpet, causing my head to throb like crazy. Inhaling a few deep breaths, I attempt to discover what happened. The view of my apartment and blaring television reveal the obvious. Another idiotic nightmare overtook my subconscious once again. I can’t summon the strength to rise. I truly thought my life was over. Tears cascade down my cheeks. My eyesight blurs into a watery mesh. Sunbeams delve through the blinds causing me to squint. At least morning has arrived. That’s the little blessing in this. I knew I shouldn’t have fallen asleep with the television on. I can be such an idiot sometimes. My limbs still shake as I raise myself off the floor. “Yes,” I call. “I’m fine. The table just fell over.” Despite my attempt to appear calm, my breathing is still rough. I hope the white lie will suffice. These night terrors have haunted me for quite some time. You’d think I’d get used to them after a while. However, it proves more the opposite. Every night just gets worse. With death lurking so close in the household, there’s no mystery why I’m paranoid. My head gets extremely woozy. I slump onto the bed. Staring at the ceiling fan, I wonder why this keeps happening. Does everyone else go through this? Death has always horrified me. People say you grow out of these fears. I, however, just seem to grow back into them. The fan twirls round and round. Anybody else would just see a household appliance. My brain transforms the blades into knives waiting to slice. If I stare long enough, I might even convince myself it's true. Breaking from the trance, I whisk out the door. It slams shut behind me. Antuna glides past the wooden table. A fresh plate of delectable eggs is deposited. I take a seat next to Gari. Eying the plate, I can’t help but be hypnotized. Sizzling bacon lies next to wheat toast. Slimy jelly oozes off onto the plate. The sheer sight makes my stomach grumble. I do not hesitate. Plunging my fork in, I shove scrambled eggs into my mouth. “It was awesome! I had a great dream about ice cream!” Gari chirps beside me. At least someone’s having good dreams around here. Given the current situation, his blissful attitude shocks me; a more correct statement would be, terrifies me. Antuna slams the dishes in the sink. The clang of metal jolts my heart. A tsunami surely approaches. “I’m sorry,” he stammers. He lowers his bacon strip back to the plate. Antuna circles back to the sink as if afraid to make eye contact. She begins washing the dishes. Seconds of utter silence ensue. Nobody knows the proper thing to say, and no one is going to attempt it. The rush of sink water drowns out all thought. Suddenly, Antuna drops the plate once more. It bangs against the sink. She doesn’t seem to notice the crash. Tears barrel down her cheeks as she rests her head in her palms. I can’t watch this sight any longer. “Okay.” Gari’s tone suggests complete relief. Both of us dart out the door without hesitation. This type of behavior is not new to me. I’m a doctor; I’ve seen all types of people around deathly situations. Antuna and Gari are actually more on the tranquil side. I have been residing here for roughly a year now. Being a live-in doctor, I really take my work home. Perhaps now the work takes me with it. Long story short, Gari is going to die. His little body can’t stand the trials and tribulations of this universe any longer. Nothing I can do will change that. After a few minutes, we reach the magnificent cliff view. Billions of people are scattered across the sandy beach below. It appears as if I’m looking at an ant hill. Of course, heights aren’t my favorite thing in the world. My mind starts to become hazy. Flashes of plummeting to my death enter my mindset. My trembling feet barely have the strength to step back. Seagulls soar in the distance, off to their next destination. Many dive bomb the people hurling food to them. Once one finds out about the smorgasbord, the whole colony bombards. Seagulls aren’t the most courteous of creatures. Right below us, a pelican thrusts its beak in the ocean to catch some fish. A big gulp indicates a successful venture. The waves crash against the shore, bringing the many surfers in. Gari then begins to speak, almost startling me. That shatters my heart. Reality punches me in the face. Life certainly isn’t fair. His foot plays with a nearby pebble, kicking it back and forth between flattened grasses. I’m terrified of death, yet this little guy is the one who has to face it head on. “It won’t,” I spark back. There is no millisecond of hesitation. Though I am not quite sure where I am going with this, something tells me I’m right. As I enter the hospital, the bustling chaos overtakes me. Each doctor, nurse, and patient purposely carries out their task. I look in awe at their determination. I discover that I am not really needed anymore. My main job is away with Gari now. Even so, I have too many friends here not to return. A lot of people aren’t exactly mentally there, but they love seeing me, and I surely love seeing them. One elderly man upstairs has no roommate. Many have been saying he's lost his marbles. Perhaps being alone that long can cause that. For a while now, he has been ranting on about ancient magic. Secret scripts and books flood his conversation. The man literally thinks he can bring back the dead! His utter belief in this stuff frightens the other patients. This man is very well known. Few in the hospital haven’t succumbed to his rambling. He goes by Mashilto. This man has actually surpassed ninety years. That is certainly an accomplishment on its own. Nonetheless, he remains mobile and social as well. He is always very kind to me. I certainly enjoy spending evenings talking to him. He always has something interesting to say, even if most of us didn’t believe it to be factual. I keep him up to date on Gari and everything going on with him. He seems almost overly interested. Empathy is surely present in those shimmering eyes. “Dr. Alcott, how are you today?” Mashilto yells with gusto as I arrive with some lunch. “I’m wonderful Mashilto! How are you? What have you been up to?” I ask with a bright smile. “How is that little boy you is lookin’ after?” Mashilto inquires. This brings my mood down a bit. Gari’s health has been decreasing dramatically. I am in no good place to talk about it. Not that there would ever be a good place to talk about it. Gazing back at him, I detect a slight twinkle in his eye. Here we go. Knowing what is undoubtedly coming, I regret my choice of words. “Can’t you?” Mashilto replies. He shuts the television off. His mystical tone indicates where this is going. “What do you mean?” I say. I’m aware his mental state is pretty much lost. 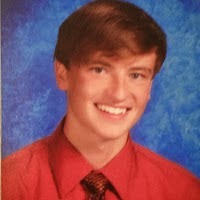 What harm would humoring him cause? “Well, look at this here masterpiece.” He points toward the floor to the left side of his bed. I maneuver around to get a better look. There lies a gigantic old book entitled, 'Altering Fate'. The enormous tome appears as if it has lived longer than he has. The cover is very durable. Many pages are crammed inside. Just as I reach down to pick the monstrosity up, the sky outside flashes. My heart jolts as light explodes. I stop and peer out the window. It looked practically like a lightning burst, yet there is no storm. No clouds float in the sky either. Dashing over to the window, I check to discover the source of the explosion. “I wish that were true, Mashilto. But I doubt even this book can save him now,” I respond in hopelessness. It’s really kind of him to want to save Gari. That’s what we all desire. He is even willing to attempt this magic book thing. Crazy man or not, I know it is the thought that counts. “This book works! My mother wouldn’t have given it to me if it didn’t. I’ve never had the courage to ever try it, but something tells me that little Gari deserves another chance.” He bursts into tears. His knees shift up to catch his falling head. I’m used to this kind of behavior daily from patients. Something, however, is peculiar about this man. “I’ve lived far too long in my opinion, Alcott. That kid deserves more than what he’s got. Please just give it a chance.” His rage startles me so much I’m speechless. That outburst took a lot out of him. His eyes fade shut. The man abandons the world, dropping into slumber. The eerie hospital room terrifies me. I’ve never seen him get like this before. My heartbeat still races. I continue to stare at the man. Mashilto survived so long, irregular behavior is normal from time to time. The things he rants of, however, do make sense. I can fully understand where he is coming from. Despite the obvious insanity, I guess I owe it to this man to take a glance at this thing. “Alright, I promise I’ll look at it,” I reply. His snores indicate I am merely speaking to myself. The weighty book is difficult to lift. It’s as if I’m lugging around a boulder. Dust clouds each page. For all I know, there could be ten million pages in here! Whoever wrote this thing needs a hobby. As he snoozes on his bed, I decide to sit down and sift through it. A lot is written in languages almost prehistoric to me, while much is in English. Maybe this thing is a sort of a Rosetta Stone type deal. Why would they bring together such varying languages? I’ll give Mashilto one thing; this book certainly is creeping me out. Perusing through, I realize there is much I can’t decipher. I’m definitely no archaeologist or whatever. The pictures of deities and spirits frighten me. Other images contain various witches hurling things into cauldrons, to gods arguing around a table. They are very elaborate drawings. Why in the world would people take so much time to create this stuff? Thinking of the illustrator startles me. I’m playing with some messed up people. Perhaps I shouldn’t do this alone. It must be deliberately chanted, also with eyes fixed on a shining star. Any star will do, but the reader must view one star and one only. That is very weird and oddly specific. I can’t imagine the reasons. After that, the only statement left in English is that 'it' would then begin. What 'it' is, neither I nor even the authors of this thing know. Neither could the translator in the book it seems. That is right where the English part ceases. Everything else seems to be printed in some ancient text. Beyond that is nothing but unknown gibberish to my eyes. It is getting really late now. The light above Mashilto’s body swings. Even that renders chills in me. I’ve got to get out of here. All of this supernatural stuff is freaking me out. Of course, I know it to be fiction. Mashilto doesn’t seem to think so. It can be kind of horrifying being alone with someone who puts that much faith into magic. Despite my best judgment, I lug the book home with me. I need something scary to read. What could it hurt? Plus I think it would break his heart if I didn’t. Heading back to Gari and Antuna’s place takes some time, but that is okay with me. A long drive can be enjoyable. It is certainly relaxing. It also feels wonderful to have some alone time. As I rumble down a now secluded dirt road, something incredibly spooky happens. All the tranquility is gone. I’m shaken to my very core.